• Connect the USB cable to the B-gate and the host, and turn on the B-gate. • After B-gate booting is complete, proceed to "Opening the printer cover → Pressing the Feed key → Closing the printer cover", and the B-gate self-test describing the LAN configuration information is printed. • Check the ETH_DHCP value in the self-test. If the value is Disabled, open the network configuration of the host (e.g., PC) and set the LAN of the host to the same as the LAN configuration of the B-gate. For example, if the default IP of the B-gate is 192.168.192.168, set the IP of the host to 192.168.192.x (x = 1 ~ 254) and the Subnet Mask to 255.255.255.0. • When connecting the LAN cable with the ETH_DHCP value set to Enabled, the B-gate automatically brings IP information from the DHCP server (router). By printing the self-test of B-gate, you can check the IP assigned to B-gate. • Utilities are provided so that users can set up the interface. • Web Utilities: It can be accessed by entering IP of B-gate in the address window of the web browser. • Native Utilities: Utility apps that can run on each OS are provided. • Connect the supported WLAN dongle to the B-gate, and turn on the B-gate. 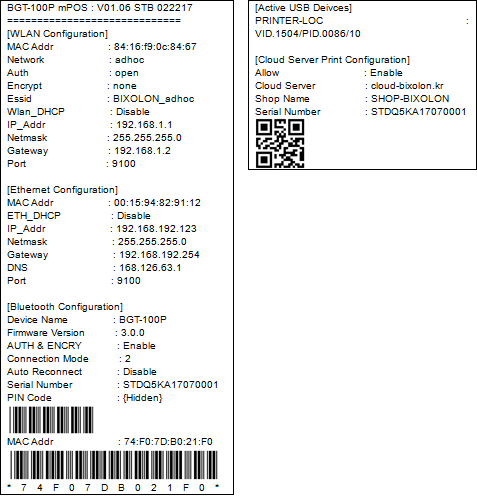 • After B-gate booting is complete, proceed to "Opening the printer cover → Pressing the Feed key → Closing the printer cover", and the B-gate self-test describing the WLAN configuration information is printed. • First check the network value in the self-test. If the value is adhoc, open the wireless connection menu of the host (PC, tablet, smartphone) and set it as adhoc before connecting. The default network mode for B-gate is adhoc, ESSID is BIXOLON_adhoc, and IP address is 192.168.1.1. • If the value is infra, connect the host to the AP connected to the B-gate. • Check the WLAN_DHCP value in the self-test. If the value is disable, the host (e.g. PC), open the network configuration and set the host's WLAN to the same as the B-gate's WLAN configuration. For example, if the default IP of the B-gate is 192.168.192.168, set the host IP to 192.168.192.x (x = 1 ~ 254) and Subnet Mask to 255.255.255.0. • Web Utilities: It can be accessed by entering the IP of B-gate in the address window of web browser. • Turn on the B-gate that supports Bluetooth. • Check the device Name value in the self-test. • Pair the devices you want to connect from the list of devices found in the host. Connect supported peripherals to the USB-A type on the back of the B-gate, and turn on the B-gate. After B-gate booting is complete, proceed to "Opening the printer cover → Pressing the Feed key → Closing the printer cover", and the B-gate self-test describing the enabled peripheral configuration information is printed.